No more head-gear for the time being, I'm in the throes of a sock binge! Buying sock yarn, buying 2 point something needles by the dozen and hell yeah, even doing some actual sock knitting. I really do go in phases. For moi some Dublin Bay socks by Ryan Morrissey at Mossy Cottage Knits (free download) made from Regia Bamboo Color in girly colours. 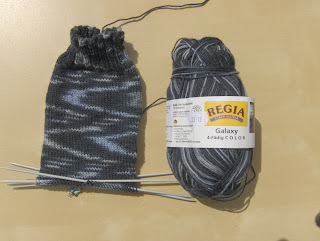 For DH some plain vanilla socks in Regia Galaxy in black and tones of grey. Not too boring though, cos you get some swirly galaxy things emerging as long as you cast on 60 or more stitches. And some shopping from Stitching Time in Hamilton. 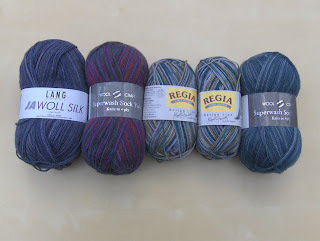 Jawoll Silk from Lang Yarns; Wool Craft Superwash Sock Yarn in blue-burgundy-green, Regia Design Line Kaffe Fassett; Wool Craft Superwash Sock Yarn in bluey-greeny. Fairly sedate colours so I can knit them for either of us, depending on who's being good. Thank you for stopping by my blog! And I'm sure glad I came here for a visit! LOVE all your photos, and browsing thru all your projects! Love your color choice for the Dublin Bay socks -- your right, definitely girly! 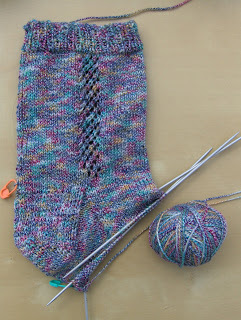 Its a Summer of sock knitting indeed - toasty toes this winter! Hvae got the sock bug myself just now - first toe up socks, having issues with the heel, sigh! yep, sock knitting can be adictive!